Bhagwati Engineering works has set new benchmarks in the market by introducing a truly reliable collection of the polypropylene pump (P.P. pump) to address the ever raising issue of corrosion & erosion associated with that of the metal pumps and deliver valuable output at the cost effective rates. 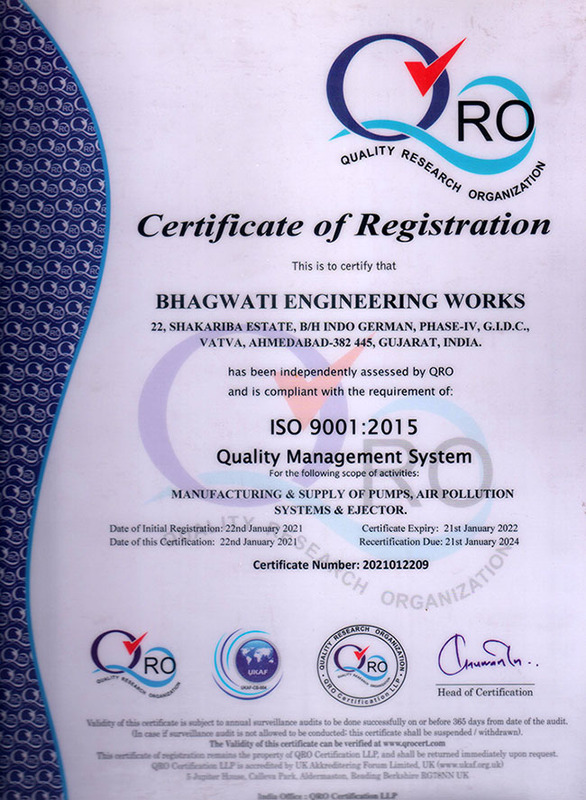 Since the first day of the instigation (1991), the team of the Bhagawati going the extra miles to propose second to none quality range of the polypropylene pump that incorporates, horizontal centrifugal pump, vertical glandless pump, vertical process pump, mud pump, chemical process pump, cantilever pump, which each is made of the polypropylene material and hence promises to perform unfailingly under the harshest environmental conditions. With the best amalgamation of the polypropylene properties and manufacturing expertise, we have been able to carry out a superlative range of the PP pump that is excellent against corrosion, abrasion, temperatures, chemicals, acids, alkalis, solvents, and stresses, which ultimately prevents leakage and premature failure of the pumps. These economic and quality advantages of our polypropylene pump over metal pumps have escalated its craze in the chemical, pharmaceutical, biomedical, food, textile industries. Other than, our secondary products (vacuum ejector, PP FRP venture) are also gaining the equal acceptance for the unmatched outcomes on the investment. The pump has invariably remained the mainstay of the industries to keep material moving during the production processes and hence the leakage of thereof has potential to fail the entire system, and is one of the serious matter against which industries are floundering. Followed by the extensive laboratory test on this matter, it is concluded that the poor resistance of the metal against corrosion and abrasion is the main culprit for premature failure of the pump and therefore consideration of the material of construction is paramount. The versatility of the material entitles easy molding of the material in the desired shape with less power consumption that ultimately reduces the manufacturing cost of the Polypropylene pump (pp pump). The polypropylene material shares light weight to high impact ratio, and hence the pump made of this material has lower weight that ensures easy handing, installing and low transportation cost. The polymer material does not corrode when subject to the corrosive liquids, thanks to its corrosion resilient property, and hence prevents the contamination of the processing material that have imposed pharmaceutical, food, medical and biochemical industries to spend huge amount on polypropylene pump p.p. pump) to which sanitation is by far important. The outstanding resistance to chemical (acids, alkalis, organic solvents, electrolytic attack, degreasing agents) has made the polypropylene pump (PP pump) a truly reliable alternative that prevents erosion of the material causing premature failure, unlikely to the metals and alloys, those fail while subject to bromine and other halogens and thereby is a best bet for extremely aggressive fluids as well as mixed chemical waste streams. The polypropylene material shares excellent strength against high stress and strains, thereby the PP pumps too, that prevents deformation of the polypropylene pump even under the toughest environments. This mechanical property of the polypropylene pump not only entitles smooth flow of the material, but also minimal the wearing caused by the friction and hence elevates the life of the PP pump at considerable extent. The material shares good withstand capabilities against high temperatures and hence polypropylene pumps are promised to outperform even under high operational temperatures (93°C to 149°C) without deteriorating. Unlikely to metal, the polypropylene pump is best suited for the industries, where ionized water is used (Biopharmaceuticals), as the material is excellent against pitting and thereby entitles repetitive cleaning, essential for highly pure water applications. Hundreds of industries have leveraged plenteous advantage of our polypropylene pump (PP pump) and experiencing completely leak free and worry free operations that you also can.